Mike Frazier was born in Portland, Oregon in 1966. After graduating law school in 1993, Mike moved to Denver, Colorado. For 11 of the past 20 years he has worked as a trial attorney. The majority of his practice has focused on defending companies and individuals in civil lawsuits in state and federal courts. Mike’s practice has focused on defending insured parties in tort and contract matters, which have resulted in death, personal injury, or significant property damage. The lawsuits have arisen from auto accidents, property conditions, fires, floods, or exposure to toxic chemicals. Mike has represented hundreds of clients in Colorado. He has received favorable jury verdicts for his clients in District Courts in Adams, Arapahoe, Boulder, Denver, Grande, Jefferson, Logan, Park and Weld Counties. 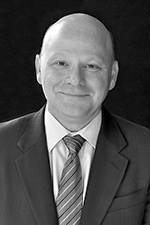 He has also represented clients in the Colorado Court of Appeals and in the Colorado Supreme Court. Prior to practicing as a trial attorney, Mike practiced in the field of environmental and hazardous waste law, working on behalf of the U.S. EPA, Army, Air Force, and Forest Service. Personal Injury Lawsuit arising out of trucking accident. Mike Frazier tried this case with Mike Wathen of Ray Lego and Associates. The Plaintiff claimed the Travelers Insured was negligent, because it failed to re-install a steep grade warning sign at the top of Crow Hill, just east of Bailey, Colorado. The Plaintiff lost control of his semi-truck, and it rolled over and into a nearby creek. The Plaintiff claimed he injured his low back, which would require a fusion surgery. He claimed he suffered from debilitating peripheral neuropathy in both legs, and the accident caused him to suffer a massive pulmonary embolism. The Plaintiff’s last written settlement offer was a global demand of $600,000 to both defendants and asked for over $1M in closing. The jury returned a defense verdict, finding no negligence, causation, or damages. Colorado Supreme Court: Legros v. Robinsons, May 2014. This a personal injury case that arises out a dog bite incident that occurred in June 2008. The Plaintiff’s file claims for negligence and strict liability pursuant to the Dog Bite Statute against Travelers’ Insured, the Robinsons. All of the Plaintiffs claims were dismissed in the District Court. The Appellate Court reversed the District Court’s opinion, in part. It affirmed the dismissal of the negligence claim and the Court’s Order denying the existence of a settlement, but the Appellate Court reversed District Court’s opinion regarding the application of the Dog Bite Statute. The Supreme Court held the Appellate Court had erred when construing and applying the Dog Bite Statute; however, it remanded the case back to District Court for further evaluation of the application of the Dog Bite Statute. Plaintiff filed suit against Defendants apartment owners and property managers, claiming they were responsible for the serious injuries Plaintiff suffered as the result of the fire started by an arsonist. The Plaintiff claimed the arsonist was a tenant of the apartments, whose rent was paid for by a public program that assisted low income residents that suffered from mental illness. The Plaintiff claimed the Defendants were responsible, in whole or in part, for the acts of the alleged arsonist. The Plaintiff’s last settlement demand was $1 million. Defendants filed a motion for summary judgment, which was granted by the Adams County District Court, which dismissed all of Plaintiff’s claims. This Order was then affirmed by the Colorado Court of Appeals, and the Plaintiff’s Petition for Certiorari was denied by the Colorado Supreme Court in October 2017. The Colorado Supreme Court reversed a judgment entered against our client by concluding that information contained in a lienholder statement issued by an insurance agent is not part of the insurance contract, and thus cannot create an ambiguity with regard to the identity of the named insured.